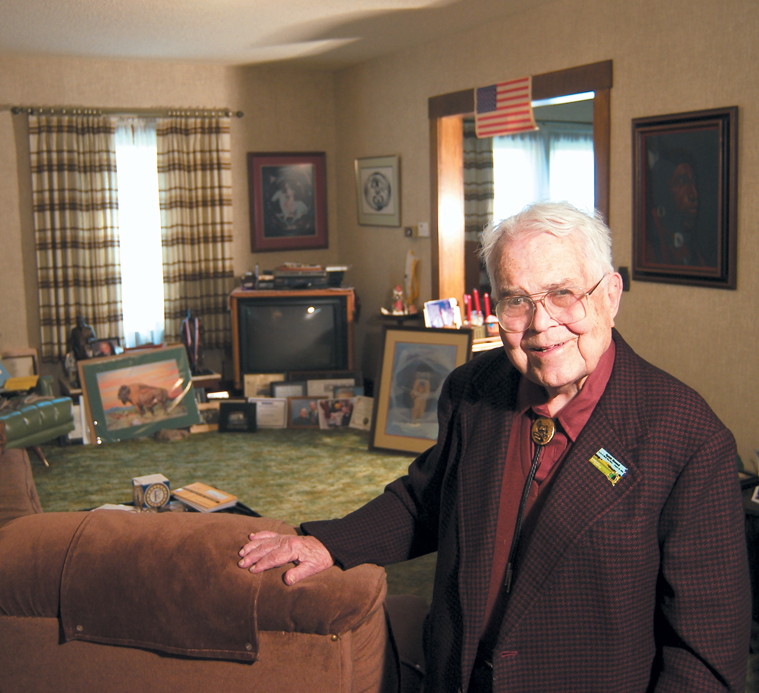 Editor’s Note: Bill Farber died in Vermillion in March 2007 at the age of 96. This story is revised from the July/August 2005 issue of South Dakota Magazine. To order a copy or to subscribe, call (800) 456-5117. Bill Farber taught political science at the University of South Dakota for 38 years, and mentored many of South Dakota's most successful people. The small man with the mighty legend prefers his brown recliner just inside the front door of a small house across the street from the University of South Dakota campus. It’s been Bill Farber’s favorite spot for years. His call, “Come in!” has welcomed students and politicos, dreamers and those who needed a firm kick. Set to celebrate his 95th birthday on July 4, Doc, as many of those students still call him, has become a living history lesson whose hand has moved behind the scene for decades in South Dakota, but whose reach has extended far beyond our borders to tackle questions of international cooperation. When I was asked two years ago to help Doc write his autobiography, I had no idea how many lessons he still had left to teach. They’re the ones rooted in history, the ones we’re doomed to repeat unless we pay attention. We began in March 2003 with a transcript of interviews from nine years earlier. We began with Doc’s dream of writing his autobiography from those transcripts. We began believing my job would be to write, rewrite and massage. Instead, we — Doc, political science secretary Mary Smart and I —embarked on a treasure hunt that became that history lesson. The basement was our Shangri-La. A trip downstairs suggests Doc never threw out a piece of paper that crossed his desk, mailbox or any conference table at which he sat. Minutes and agendas — often multiple copies — from meetings held everywhere from Vermillion to Paris for the last eight decades. Letters to Doc and from him. Speeches and bits of speeches mixed with copies of the high school newspaper and yearbook he edited, old report cards, college papers, reports and research material. The basement yielded treasures, but none so good as the day Doc wondered what was in the battered suitcase under another tall pile of papers. Inside, we found the letters he’d sent home from World War II and asked his mother to save. We also found letters he’d sent from Korea when he was setting up a school of public administration. More than two years later, Footprints on the Prairie is due from the publisher this month (July) in time for Doc’s birthday celebration. At nearly 95, nothing seems to quench his interest in the world. Maybe to the chagrin of administrators and lawmakers, nothing can stop the endless flow of suggestions to improve government. Just this spring, as committees discussed how to revitalize the legislature, Doc suggested that lawmakers meet quarterly, so they could deal with problems continuously through the year. Bills could be introduced in one session, adopted the next. Legislators could take advantage of what’s being done in other states. Since money has always been a problem for state government, Farber also suggests adding 2 percent to everyone’s federal income tax returns and designating the revenue for health and education. “It’s simple,” he said. 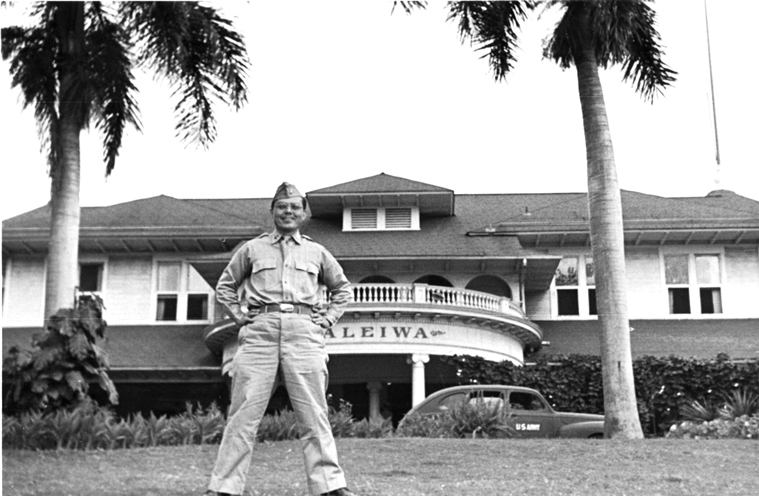 A believer in travel and public service, Farber served in the Air Force at Hickman Field in Hawaii. His rallying cry for more laws to encourage government consolidation in a state with few people never ends. “We need to do some bold thinking and not be afraid of experimenting,” he said. The broad outlines of Doc’s story have often been told. He was hired to teach government at USD in 1935, and long before he retired as department chairman in 1976, he had become a force to reckon with. He’s still tickled that his July 4 birthday — just after the cutoff — meant he could teach until he was almost 66, instead of the previously state-mandated 65. Here is the rare man who practices what he preaches. He believes in teaching and in public service. He helped establish South Dakota’s Legislative Research Council, and worked for constitutional revision, home rule, and single-member legislative districts. Besides the school of public administration in Korea, he helped set up an international training program for public administrators in Bruges, Belgium. And he taught, his students becoming his family as he challenged them to do more than they thought they could. Among others, he prodded Tom Brokaw and Pat O’Brien — arguably the state’s best-known television personalities — out of college failure. Besides that noteworthy duo, Farber mentored Rhodes and Fulbright scholars, and his students run multinational corporations, teach at the nation’s largest universities, run for political office and write books. Most of Doc’s protégés are men. Mary Lynn Myers, one of the few exceptions, said there weren’t many women political science majors in her era. Besides, many of the men Doc mentored were those who were dropping by the wayside, she said. “Young women didn’t do that very often.” Women had to be smart, determined and wear thick skins if they went into political science. Farber’s house is packed with miscellany from around the world. A Korean screen was a gift from a grateful father after Doc wrote a tuition check for the son. Doc’s dad started the collection of barber bottles. And there are books and photographs, more photographs than anyone would want to count. 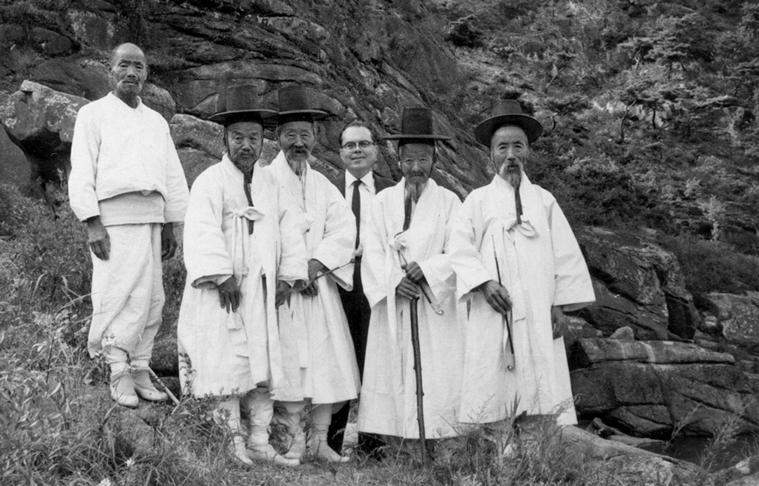 In the 1950s, Farber helped to establish a school in South Korea and was pictured with a group he called, "five wise men." Doc’s South Dakota accomplishments are well known. When racial equality became an issue in the courts and on the streets, Doc helped found the Institute of Indian Studies at USD, which brought tribal leaders together to talk about challenges they faced. When state senators and representatives saw the need for better information, Doc pushed and helped organize the Legislative Research Council. But his eye has never been confined by the state line. In the two years we worked together, America invaded Iraq. Farber had lived through and helped shape national and international policy during the Cold War; he believed then, and he believes now, there’s no reason to go into combat. “Footprints” doesn’t dwell on war and peace, but the times threw war in our faces. Doc has believed in a global community since he was president of the international relations club at Northwestern University during the Depression. He still remembers the German speaker who predicted that war would come, and Germany would be blamed. He does not excuse Hitler, but he says the economic roots of World War II were fostered by greed in countries like the United States. When war broke out in Europe a decade later, Farber was teaching at USD. What many have forgotten is that this country was largely isolationist in the 1930s. In 1940, Doc debated against Roosevelt’s lend-lease deal with Britain, believing it would draw America further into the war. He taught a Sunday school class for young men who knew they would have to go. At 30, he asked a local minister whether a Christian could kill, even in military duty. The minister preferred not to answer. Today, Farber still feels guilty he wasn’t a conscientious objector. “I just didn’t have the guts,” he said. Farber advised a young Tom Brokaw to quit college until he was done partying. 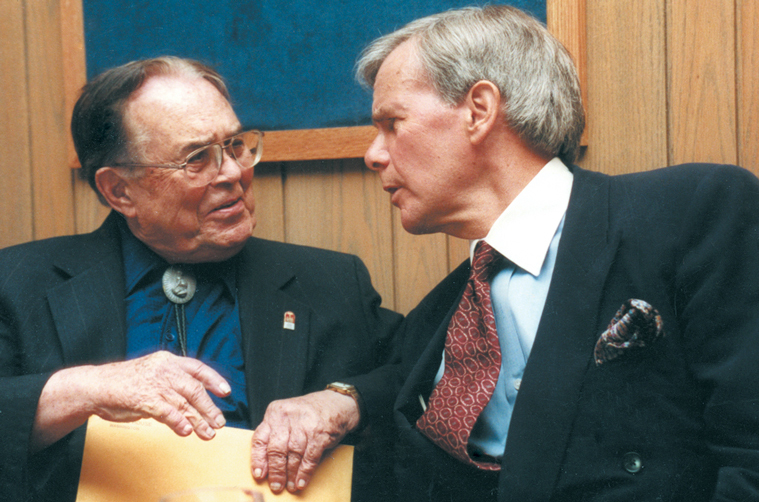 Brokaw returned to campus with a better attitude and the rest is broadcast journalism history. Doc lived through war pricing and rationing, and his basement yielded sheaves of letters to merchants and manufacturers. A Des Moines manufacturing company learned how to set South Dakota prices for salad dressings; the Watertown War Price and Rationing Board was not allowed to add an extra charge for sacking sugar; an Iowa café was allowed to raise its milk prices. No university professor in South Dakota history has been accorded the honors of Dr. Farber on USD's Vermillion campus, where there is a Farber lecture series, a Farber scholarship fund and Farber Hall. 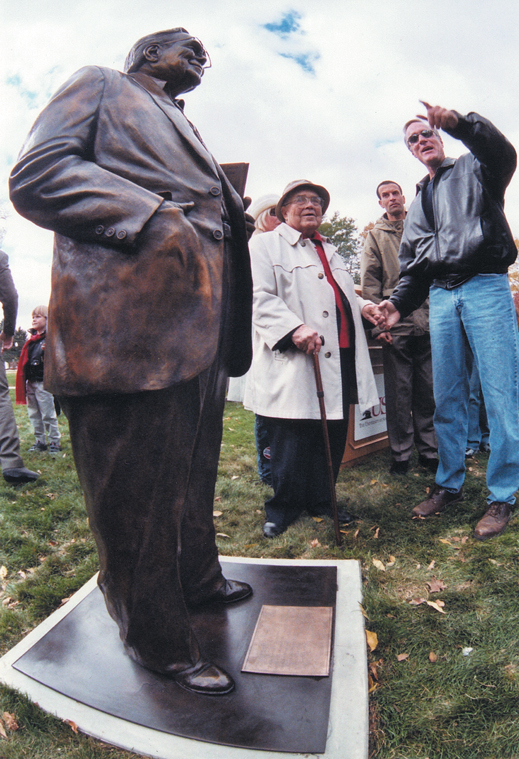 An outdoor bronze of the genial prof was unveiled in 2002 on the university lawn near Old Main. From war, Farber learned to trust international organization; he’s convinced the 1945 formation of the United Nations should have eliminated combat. But he’s been discouraged. “Here we are again not seeing to it that the United Nations is the institution it ought to be,” he said recently. He’s convinced that the United States still does not understand the importance of international problems. A dedicated traveler, Doc learned about fitting into another culture when he spent six months in late 1958 — just five years after the end of the Korean War — in South Korea helping set up the school of public administration at Seoul University. In true Farber fashion, Doc half adopted a troupe of high school boys, helping them with their English, taking them out to eat and to see sites in Korea they would not see on their own because they had no transportation. And he learned. The lessons continued when South Dakota’s Sen. Karl Mundt asked Doc to be minority counsel for the Senate Subcommittee on National Policy Machinery, a committee charged with making government more efficient. In his first Washington stint, 1960-61, Doc studied New York Governor Nelson Rockefeller’s proposal that would allow the president to appoint a first secretary of government to reorganize the executive office and improve response to national security and foreign affairs — an idea Farber would still like to see implemented. Returning to Mundt’s service in 1965, Doc became the senator’s consultant to the North Atlantic Assembly’s Committee on Education, Information and Cultural Affairs. In that capacity he helped set up an international training seminar for mid-level government administrators. This was Doc doing what he believed in most: Training public servants to be the best they could be. Doc despairs at America’s inability to avoid war. “We ought to be better, and I am not confident, on the basis of our past record, that we can successfully avoid another major conflict — and that could well be the end of civilized society as we know it,” he wrote. His conviction has not changed. That’s when I understood Doc’s magic.